File Label Express Document Management is an integrated comprehensive solution for managing electronic content related to your records. It can also be utilized to manage records that have been labeled and in the active filing system, but have then as a matter of policy or expediency been scanned. Yes, that’s right! File Label Express can not only create your file labels and manage your file data, but it can also be upgraded to handle changing requirements as they occur. No other file label software on the market can offer this unique flexibility, ensuring that your investment in label printing can be further leveraged as your needs change. The File Label Express DM will run on any device that has access to the internet or the internal enterprise network owing to its state of the art architecture and HTML 5 Compliant design. 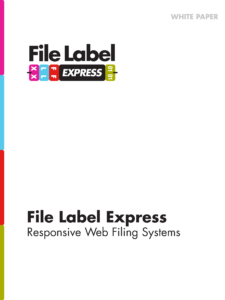 The File Label Express DM relies on powerful open source tools, modern coding methods and standards to ensure that no exorbitant licensing of Server OS or Database Servers are required while delivering functionality that Enterprise users value in the real world. Yet another option your initial investment in color coded labeling or migration from outdated systems can provide! As your needs change and grow, your provider should provide solutions to enable you in effective management. File Label Express is the only complete solution on the market for your Label and Document Management needs. Start Using File Label Express DM today for only $49.95/month/user!